538 pages | 3 Color Illus. | 5 B/W Illus. 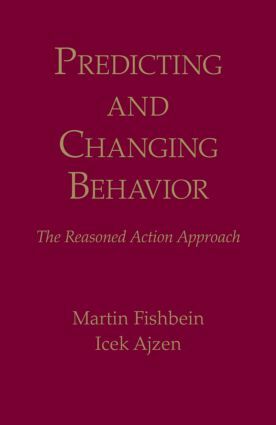 This book describes the reasoned action approach, an integrative framework for the prediction and change of human social behavior. It provides an up-to-date review of relevant research, discusses critical issues related to the reasoned action framework, and provides methodological and conceptual tools for the prediction and explanation of social behavior and for designing behavior change interventions. 1. Introduction. 2. Defining and Predicting Behavior. 3. Attitudes and Their Determinants. 4. Perceived Norms and their Determinants. 5. Perceived Behavioral Control and its Determinants. 6. Attitudes, Norms and Control as Predictors of Intentions and Behavior. 7. General Attitudes and the Prediction of Behavior. 8. Challenges to the Reasoned Action Approach. 9. Changing Behavior: Theoretical Considerations. 10. Changing Behavior: Sample Interventions. 11. Conclusion.